17 A None No Power Seat 17 A is a standard Premium Economy Class seat that may have slightly restricted legroom due to the position of the bulkhead. There is no floor storage for this seat during take-off and landing. 17 C None No Power Seat 17 C is a standard Premium Economy Class seat that may have slightly restricted legroom due to the position of the bulkhead. There is no floor storage for this seat during take-off and landing. 17 D None No Power Seat 17 D is a standard Premium Economy Class seat that may have slightly restricted legroom due to the position of the bulkhead. There is no floor storage for this seat during take-off and landing. 17 E None No Power Seat 17 E is a standard Premium Economy Class seat that may have slightly restricted legroom due to the position of the bulkhead. There is no floor storage for this seat during take-off and landing. 17 G None No Power Seat 17 G is a standard Premium Economy Class seat that may have slightly restricted legroom due to the position of the bulkhead. There is no floor storage for this seat during take-off and landing. 17 H None No Power Seat 17 H is a standard Premium Economy Class seat that may have slightly restricted legroom due to the position of the bulkhead. There is no floor storage for this seat during take-off and landing. 17 K None No Power Seat 17 K is a standard Premium Economy Class seat that may have slightly restricted legroom due to the position of the bulkhead. There is no floor storage for this seat during take-off and landing. 20 C None No Power Seat 20 C is a standard Premium Economy Class seat. 20 D None No Power Seat 20 D is a standard Premium Economy Class seat. 21 A None No Power Seat 21 A is a standard Premium Economy Class seat however, the proximity to the lavatories may be bothersome. 21 C None No Power Seat 21 C is a standard Premium Economy Class seat however, the proximity to the lavatories may be bothersome. 21 D None No Power Seat 21 D is a standard Premium Economy Class seat however, the proximity to the lavatories may be bothersome. 21 E None No Power Seat 21 E is a standard Premium Economy Class seat however, the proximity to the lavatories may be bothersome. 21 G None No Power Seat 21 G is a standard Premium Economy Class seat however, the proximity to the lavatories may be bothersome. 21 H None No Power Seat 21 H is a standard Premium Economy Class seat however, the proximity to the lavatories may be bothersome. 21 K None No Power Seat 21 K is a standard Premium Economy Class seat however, the proximity to the lavatories may be bothersome. 4 A None No Power Seat 4 A is a standard Business Class seat whose proximity to the lavatories and galleys may be bothersome. 4 C None No Power Seat 4 C is a standard Business Class seat whose proximity to the lavatories and galleys may be bothersome. 4 D None No Power Seat 4 D is a standard Business Class seat whose proximity to the lavatories and galleys may be bothersome. 4 G None No Power Seat 4 G is a standard Business Class seat whose proximity to the lavatories and galleys may be bothersome. 4 H None No Power Seat 4 H is a standard Business Class seat whose proximity to the lavatories and galleys may be bothersome. 4 K None No Power Seat 4 K is a standard Business Class seat whose proximity to the lavatories and galleys may be bothersome. 45 A None No Power Seat 45 A is a standard Economy Class seat that may have extra legroom due to the exit however, this seat it missing a window. The proximity to the lavatories and galleys may be bothersome. The tray table is in the armrest, making the armrest immovable and slightly reducing seat width. There is no floor storage during take-off and landing. 45 C None No Power Seat 45 C is a standard Economy Class seat that has extra legroom due to the exit however, the proximity to the lavatories and galleys may be bothersome. The tray table is in the armrest, making the armrest immovable and slightly reducing seat width. There is no floor storage during take-off and landing. 45 H None No Power Seat 45 H is a standard Economy Class seat that has extra legroom due to the exit however, the proximity to the lavatories and galleys may be bothersome. The tray table is in the armrest, making the armrest immovable and slightly reducing seat width. There is no floor storage during take-off and landing. 45 K None No Power Seat 45 K is a standard Economy Class seat that may have extra legroom due to the exit however, this seat it missing a window. The proximity to the lavatories and galleys may be bothersome. The tray table is in the armrest, making the armrest immovable and slightly reducing seat width. There is no floor storage during take-off and landing. 46 D None No Power Seat 46 D is a standard Economy Class seat that may have restricted legroom due to the position of the bulkhead. The close proximity to the galley may be bothersome. The tray table is in the armrest, making the armrest immovable and slightly reducing seat width. 46 E None No Power Seat 46 E is a standard Economy Class bulkhead seat that may have limited legroom due to the position of the bulkhead. The tray table is in the armrest, making the armrest immovable and slightly reducing seat width. Passengers traveling with infants are often seated in this row. The close proximity to the galleys and lavatories may be bothersome. 46 F None No Power Seat 46 F is a standard Economy Class bulkhead seat that may have limited legroom due to the position of the bulkhead. The tray table is in the armrest, making the armrest immovable and slightly reducing seat width. Passengers traveling with infants are often seated in this row. The close proximity to the galleys and lavatories may be bothersome. 46 G None No Power Seat 46 G is a standard Economy Class bulkhead seat that may have limited legroom due to the position of the bulkhead. The tray table is in the armrest, making the armrest immovable and slightly reducing seat width. Passengers traveling with infants are often seated in this row. The close proximity to the galleys and lavatories may be bothersome. 56 A None No Power Seat 56 A is a standard Economy Class seat that is missing a window. 56 K None No Power Seat 56 K is a standard Economy Class seat that is missing a window. 59 A None No Power Seat 59 A is a standard Economy Class seat in the last row of the aircraft whose proximity to the galley may be bothersome..
59 C None No Power Seat 59 C is a standard Economy Class seat in the last row of the aircraft whose proximity to the galley may be bothersome..
59 D None No Power Seat 59 D is a standard Economy Class seat in the last row of the aircraft whose proximity to the galley may be bothersome..
59 E None No Power Seat 59 E is a standard Economy Class seat in the last row of the aircraft whose proximity to the galley may be bothersome..
59 F None No Power Seat 59 F is a standard Economy Class seat in the last row of the aircraft whose proximity to the galley may be bothersome..
59 G None No Power Seat 59 G is a standard Economy Class seat in the last row of the aircraft whose proximity to the galley may be bothersome..
59 H None No Power Seat 59 H is a standard Economy Class seat in the last row of the aircraft whose proximity to the galley may be bothersome..
59 K None No Power Seat 59 K is a standard Economy Class seat in the last row of the aircraft whose proximity to the galley may be bothersome..
7 C None No Power Seat 7 C is a standard Business Class seat whose proximity to the lavatories and galleys may be bothersome. 7 G None No Power Seat 7 G is a standard Business Class seat whose proximity to the lavatories and galleys may be bothersome. 7 K None No Power Seat 7 K is a standard Business Class seat whose proximity to the lavatories and galleys may be bothersome. This Boeing 787-900 (789) seats 195 passengers and is primarily used on International routes. The cabin has been updated with the latest features and amenities including larger overhead bins and windows, dimmable shades, higher ceilings, lower cabin pressure, personal ventilation air vents above each seat, Audio Video on Demand with large touch screen LCD's, Sky Bar, and LED mood lighting throughout the aircraft. Sat in 20H Syd-Narita: Very comfortable and even though had a few times i got a little sore, a quick move around sorted that out. Excellent leg room. excellent plane. Would fly this again. I would avoid this seat; there is a lot of noise from the galley in front throughout the flight, enough that it made it hard to sleep. Better choices would be further back in the cabin. The second galley, behind row 4, was much quieter than the front because it was just bathroom traffic, no food prep. I am 6'3" tall and found the available legroom no different to other PE seats (I also flew sectors in 20Cx2 and 20H in the last month). My concern with the bulk head seats is the usual lack of storage and armrest screen and tray table which. Having to stow the screen in particular during take-off and landing is annoying. Row 17 in Premium Economy has a small screen and small table that come out of the arm rest. Try other row 18 ,19, 20. I sat in business and think the seats and bed were comfy. I think the seats on the sides are better than the ones in the middle and I opted to move. The engines on the 787 are very smooth. The service is excellent and food quite good. 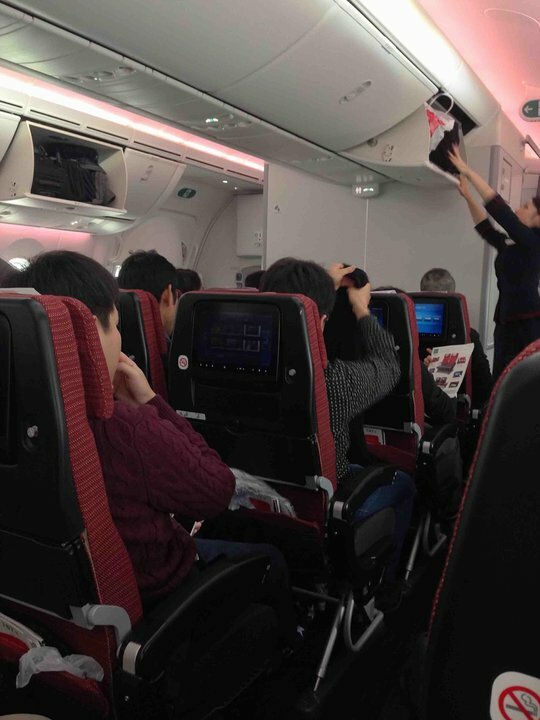 JAL completely buck the trend towards cramped economy cabins with a stunning interior to their 787-9. Only eight seats across with excellent seat pitch (34 inches) and no obstacles down below. I haven't been so comfortable on a long-haul flight for years (I am 185 cm with long legs). Large touch-screen videos were excellent, as were the funky fader windows. Loved this seat, and loved this aircraft (this configuration is now standard on the Boston/Narita run). Though it is a window seat, it has individual aisle access. 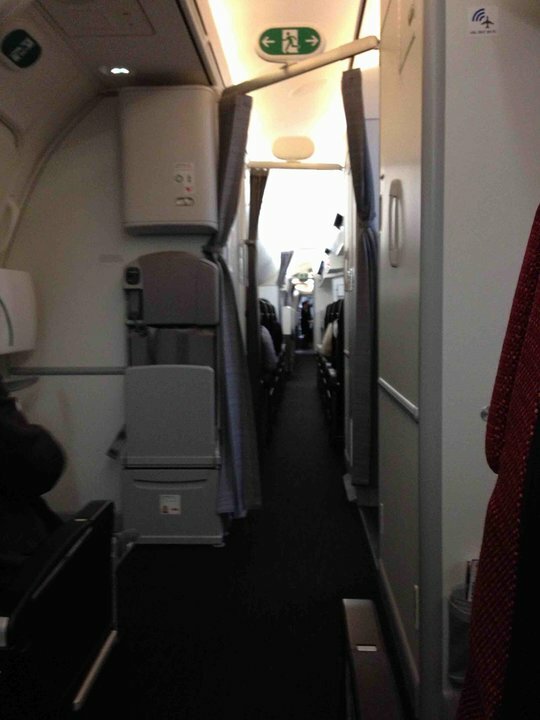 Once the divider is up after take-off, you have good all-round privacy in the open suite. Full-lie flat bed with good foot support in the footwell. Lots of space (in width and length), beautiful service from the very helpful and cheerful staff. The dinner windows work well and are not a gimmick as some have said. When fully darkened, bright sunlight outside becomes an almost a complete black/deep purple. The advantage is that you can adjust the degree of tinting so that you can see out comfortably at all light levels from bright sunlight downwards (though it is a bit awkward to do as as they only respond slowly to the control, so it takes a bit of up and down to get it right). The only criticism I have of the window seat is that there is no pocket storage for small items (aisle seats have this), and I found the entertainment controller erratic and non-intuitive. But, hey, who's complaining? The rest was so good!